Shopping for nursery bedding can turn up some treasures at great prices to save money in your nursery design. Many sets cost over $100 for just three or four pieces, making sets with more pieces and those that cost less a good deal. Bank the savings or use it to further create your ideal nursery décor. Some of the best nursery sets are inexpensive and give a lot of bang for the buck. 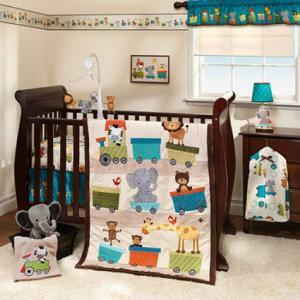 Larger 13-piece sets include enough items to complete an entire nursery. The Boutique Pink Gray Elephant Crib Bedding Set from Geenny Designs, well-known for its nursery design series. This set contains all you need to decorate a nursery. The crib set fits standard cribs and toddler beds. Interesting items in the set include three "New Wall Art Décor Hangings" and a carrying bag complete with zipper and handles. The patterns for this set are sewn onto the items instead of simply being printed onto fabric. Customers are highly pleased with the quality and price of this set. While cheap, one customer noted that it is "Good quality for the price, very cute!" and another said "Price wise it was a great buy." Another noted that this was a good deal, saying "The material isn't the best quality in the world, but I am very satisfied with it still." Amazon's price is around $100 plus shipping. 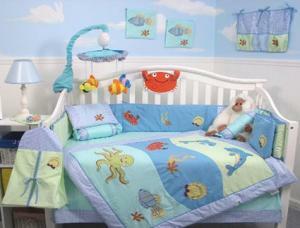 The 13-piece Dolphins Baby Crib Nursery Bedding Set from SoHo Designs is perfect for any beachcomber. In fact, the set could be gender neutral if blue, yellow, and aqua are your ideal color scheme. The quilt is designed with these three colored waves with cute sea creatures and dolphins. The set is designed to fit "all" cribs (single or convertible), as well as toddler beds. Overall, customers are satisfied with their purchase. "The comforter is soft and the whole set is a great deal," said one customer. Another noted that "The obvious quality of this set was a wonderful surprise." One customer complained that the bib received was plain white without any sea theme motif. One customer did note the set was cute but not made of good material though. Amazon lists the set at $65 with free shipping. If you traditional and following a gender specific color scheme, you can find many crib bedding designs for a low price. This type of nursery design is popular with pink assigned to girls and blue assigned to boys. The three-piece Animal Choo Choo Express crib bedding set by Lambs & Ivy Bedtime Originals is perfect for a boy's nursery. The quilt is made from a polyester/cotton blend with 100% polyester filler. The sheet is 100% cotton and the dust ruffle is 100% olefin. Customers are enamoured with the bedding design. One customer states, "This bedding set is really cute. Great value!" Other customers noted the set's "very nice quality" and one said it was "very affordable. Nice quality, vibrant colors." Get it at Walmart for just over $40 and free store pickup or shipping. There are many choices for inexpensive bedding when it comes to cribs that are also highly attractive. You can decorate your baby nursery with stylish and colorful bedding and accessories without having to spend a fortune.